This dish is a wonderful testament to the adaptability and usefulness of leftovers. By taking the main components of lamb stew with red wine, potatoes, and carrots and adding some fresh spices and butternut squash, I transformed leftovers that would have been delicious but the same into something both delicious and new. 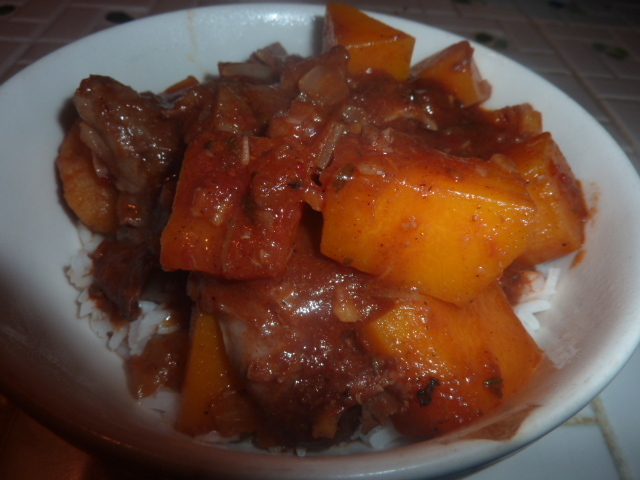 The aromatic cumin, paprika, and ginger combined with the sweet butternut squash changed the original lamb stew into something different, interesting, and delectable. The sweetness of the butternut squash really worked well with the rich, savory lamb and it’s stewing liquid. When married with the cumin, paprika, and ginger, the entire combination sang. I heated up the leftovers today and was even more impressed with them this time around. If you don’t have leftovers from the lamb stew with red wine, potatoes, and onions, I suggest simmering some tomato sauce with a glug or two of red wine and thyme for awhile to allow the flavors to meld. Brown up your lamb shank and then either braise it in the oven, covered, for a couple of hours or simmer on the stove top for a couple of hours. You could also substitute cubed stew meat, although I think the inclusion of the bones goes a long way toward explaining the richness of the sauce. Skim off the fat, set aside, and follow the recipe as suggested. Remove the meat from the bone of the lamb shank and roughly chop. Set aside. Heat olive oil over medium heat in a heavy-bottomed sauce pot. Add ginger and onion and sauté, stirring frequently, until onion is translucent and ginger is fragrant, about 4-6 minutes. Add butternut squash and all seasonings. Stir to combine. Add leftover liquid from lamb stew with red wine, potatoes, and carrots. Cover pot and reduce heat to simmer. Simmer 2o minutes. At this point, squash should be mostly tender. Add lamb meat and stir well to combine. Taste sauce for seasonings and adjust as necessary. Cover pot and simmer another 10 minutes until meat is heated through.